There are about thirteen distinctive medieval graveslabs in the graveyard at St John's, C of I, Church in Ballymore Eustace. They belong to a group of medieval slabs in the Wicklow, Kildare, Carlow and Dublin area. These 13th/14th century slabs are known as the Hollywood slabs, named after the area in Wicklow where the were first discovered. 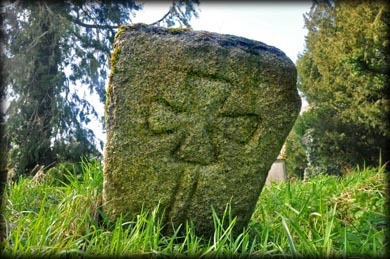 The archaeologist, Christiann Corlett has identified three different groups, one group features graveslabs bearing crosses with splayed terminals, another group bears plain crosses and the third group has ringed crosses. All of the slabs are granite. I hope to add images from some of the slabs at Aghowle, Ballycook, Burgage, Castledermot, Castlemore, Clonmore, Donard, Dunboyke, Gaganstown, Graney, Hollywood, Kilbride, Killelan, Lacken, Saggart, Straboe and Templeogue. I identified six of the slabs on my first visit to St John's and will hopefully identify some more on my return. There are two High Crosses present at the site and an effigy of a knight in armour, can be found inside the church. Situated: The graveslabs are located in the graveyard of St John's C of I Church, on the north side of the R411, on the east side of the town. Ref: Corlett, Christiaan. “The Hollywood Slabs: Some Late Medieval Grave Slabs from West Wicklow and Neighbouring Counties.” The Journal of the Royal Society of Antiquaries of Ireland, vol. 133, 2003, pp. 86–110. JSTOR, www.jstor.org/stable/25509110.